I love dragons. I've had this weird obsession with them ever since I devoured The Dragon of Lonely Island by Rebecca Rupp in the third grade. 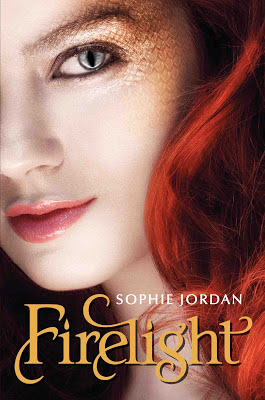 So, when I heard of Firelight, I knew I had to read it. As soon as I cracked the spine, I knew I was in for a wonderful tale of mythical creatures and forbidden love. The mythical creatures rose to meet my expectations. The concepts of "draki" and hidden "prides" are fascinating. I only wish that the characters had spent more time in the pride. The story focuses mostly on Jacinda's life in the human world. I would rather have learned more about her true nature and the lives of those in her pride. I'm hoping the sequels will elaborate more on the draki. The forbidden love fell a little short for me. This is a flaming case of insta-love. The story includes overused phrases such as "I'm the oxygen his lungs need" and "the boy I can't resist." Even though the characters did share chemistry, their relationship was formed on passion, not on true love. Still, I enjoyed learning about the characters. Jacinda, as you can probably guess, has a fiery personality to match her draki. Will is your stereotypical hottie, but that didn't stop me from falling for him. Jacinda's sister, Tamra, is nothing like her. I enjoyed reading about the girls' relationship as sisters. As with real sisters, they alternate between annoyance and fierce loyalty. This gorgeous cover hides an original tale of dragon-like creatures surviving in the human world. While I obviously had some criticisms, overall I enjoyed reading about the beauty and secrecy of draki. I'd recommend this one to any fans of supernatural romance. I'll definitely be looking into the sequels in hopes of learning more about these creatures.